Every year Save the Children’s State of the World’s Mothers report ranks the best and worst places in the world to be a mom, giving us a window into the shared strengths and burdens that mothers face. All mothers carry the brightest hopes for their children’s health and wellbeing, whether their homeland is at the top, middle or bottom of the ranking. To show you how motherhood unites women from all corners of the world and walks of life, we have invited two moms from two different continents to talk about the trials and tribulations of motherhood in their countries. 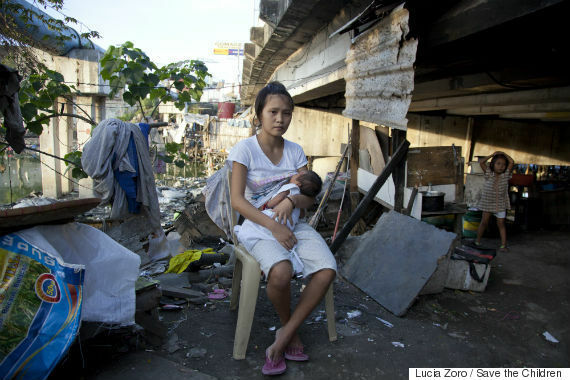 Metro Manila, Philippines: Rizelle, 17, pictured holding her three-week-old baby, lives in a makeshift home under a bridge in the slums of Metro Manila. But she was fortunate to receive post-natal check-ups and immunizations for her newborn. Maria Christina H. Oñate is from Metro Manila, Philippines. Holding the 105th spot out of 179 nations, the Philippines is a middle-of-the-road country for moms that has made great progress in recent years, especially in reducing the child mortality rate for the poorest children in cities. Rosalie Djouma is from the Central African Republic, which at the 177th spot is the third worst place in the world to be a mom. Together, these two women represent two countries with very different realities for mothers and babies. Both women have dedicated their lives to helping some of the most vulnerable moms and children in their communities as part of their work with the international organization Save the Children. Here, they share their stories of motherhood, as well as their hopes and aspirations for all moms around the world — whether they live in bustling Metro Manila or the rural countryside of the Central African Republic. Oñate: The Central African Republic is third from the bottom in the annual ranking of the best and worst places for moms. What was it like for you to raise children in a country that ranks so low for moms? Djouma: As a nursing medical supervisor with Save the Children working in the Central African Republic, my experience as a mother is rather unique compared to many women in the country. My job allows me to provide for the health and education of my children and support my family. 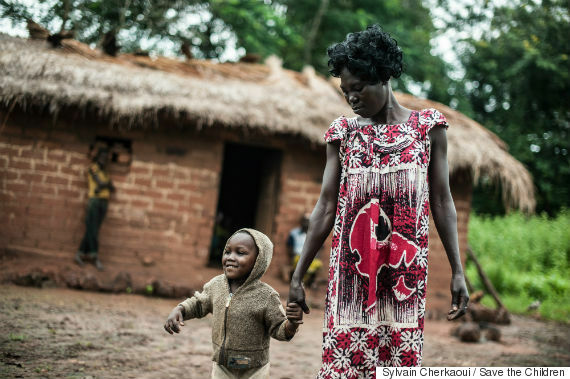 The sad reality for many mothers in the Central African Republic is that the social safety nets and reliable health services are not available, leaving them and their children vulnerable to extreme poverty. Djouma: You’re fortunate to live in a country that does much better in the ranking than my homeland. What’s it like to be a mom in the Philippines? Oñate: My son Diego is now a healthy, bright and curious three-year-old. I remember the wonderful time I was pregnant. As a working professional in Manila with health insurance, I had access to quality health services, which allowed me to take advantage of family planning counseling and newborn care. My son benefits from preventive care, immunizations and the luxury of doctors’ visits whenever he feels unwell, which is a far cry from the situation for many mothers. Oñate: What are some specific challenges moms in the Central African Republic face? Djouma: The current situation for mothers and children in the Central African Republic is critical. During the political and military crisis there are some mothers who have lost their husbands, their property and who do not have a source of income. Some children who have lost their fathers and mothers become easily exploited by certain groups of people. Many children are unable to continue their studies. Rural mothers have similar struggles to those living in slums. The differences are that rural mothers have farm work, while those from slums have small businesses. Djouma: What’s some of the progress the Philippines has made for moms and children? Oñate: The Philippines is making strides towards progress in the care of moms and children with the introduction of programs through a new national social protection initiative, the implementation of health care innovations and by increasing the number of health professionals serving urban and rural communities. In my work I get to listen to the people behind inspiring stories who unceasingly help vulnerable mothers and children access basic health care. They are committed community health workers who do home visits and counseling to pregnant and lactating women to ensure healthy pregnancy and safe delivery and care for newborns, including the importance of exclusive breastfeeding. Djouma: The new report commends the Philippines for the progress it has made in reducing child mortality and narrowing the survival gap between the richest and poorest children in urban areas. What challenges still remain for the poorest moms and children in cities? Oñate: My work on maternal and child health in marginalized communities in Manila brings me up close and personal to the everyday struggle of poor, unemployed mothers with usually four or more young children. The struggle to find ways of putting a meal on their table is constant and, more often than not, their health and that of their children takes the back seat. These poor urban mothers are at risk of dying due to pregnancy and childbirth because of a lack of access to health services. These are mothers, including teenagers as young as thirteen, who experience unplanned pregnancies, lack adequate prenatal care, give birth at home with no skilled birth professional, have no access to emergency obstetric and neonatal care, and receive no postpartum care. Oñate: What would it take to improve the conditions for mothers and their children in the Central African Republic? Djouma: Many women are responsible for financially providing for their families and need additional support to generate incomes — whether through entrepreneurship or agricultural opportunities. Families also need expanded access to education and health care facilities to help ensure the safety and wellbeing of children, in both rural and urban areas. Save the Children’s annual State of the World’s Mothers report, which was released this month with support from Johnson & Johnson, has become a reliable international tool to show where mothers and children fare best, and where they face the greatest hardships. It is based on the latest data on health, education, economics and female political participation. The full report is available at:www.savethechildren.org/mothers. Editor’s Note: Save The Children is a partner of Johnson & Johnson, which is a sponsor of The Huffington Post’s Global Motherhood section.